Hi! Today I have another card featuring the Best Catch bundle from the Occasions Catalog. Love how this card turned out – and it is a pocket card – so you can tuck a little gift card or your note right there. For this card, I sponged Balmy Blue and So Saffron ink on pieces of Designer Series Paper from the Wood Textures pack. 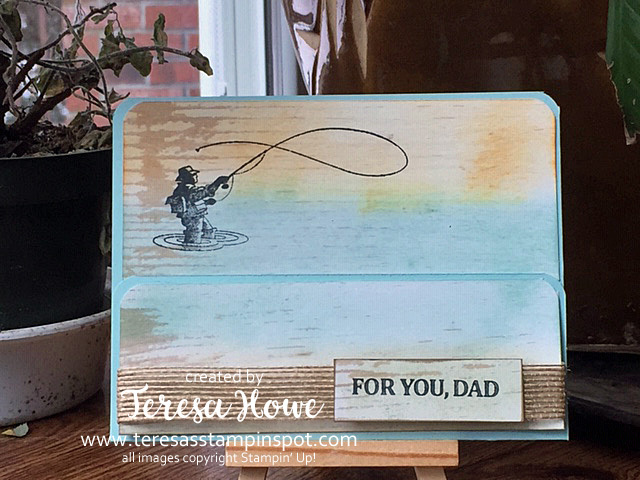 The fisherman is stamped in StazOn Jet Black ink. The base of the card is Balmy Blue. A little burlap ribbon to finish it off. For the base, start with a piece of Balmy Blue measuring 5 1/2″ x 8 1/2″. Score at 4 1/4″ on the 8 1/2″ edge. Slide the score line to the 2″ mark and cut (this allows you to create the pocket). From the same sheet of Designer Series Paper, cut one piece 5 1/4″ x 2 1/2″ and another 5 1/4″ x 1 3/4″. Save a scrap for the sentiment. On the larger piece, sponge Balmy Blue on the bottom and So Saffron on the top to create the water and sunset. Then stamp the fisherman. On the smaller piece, sponge Balmy Blue on the top and Old Olive on the bottom (hard to see in this picture given the ribbon). Use the envelope punch board to round all the corners. Attach the top piece to the Balmy Blue base. Use Tear & Tape on just the two sides of the lower flap and adhere to make the pocket. Wrap the ribbon around the Designer Series Paper before attaching to the front of the pocket. Add your sentiment and done! Don’t forget, Sale-A-Bration ends this month! So take advantage and earn your FREE goodies today! Shop my on-line store here. Use Host Code: 9DY7KYRM and earn a FREE tutorial featuring the Beauty Abounds bundle! 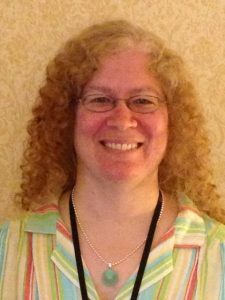 Author TeresaPosted on March 3, 2019 March 5, 2019 Categories CardsTags 2019 Occasions, Facebook Live, MasculineLeave a comment on Fly Fishing Anyone? Hi! 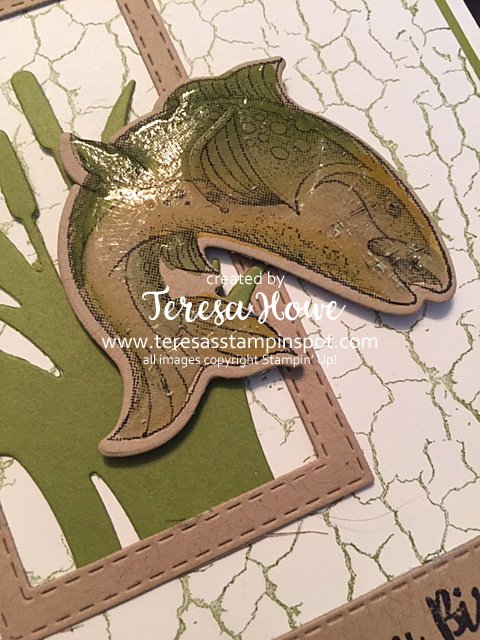 Today I am sharing the card I made during last week’s Facebook Live using the Best Catch bundle in the Occasions Catalog. 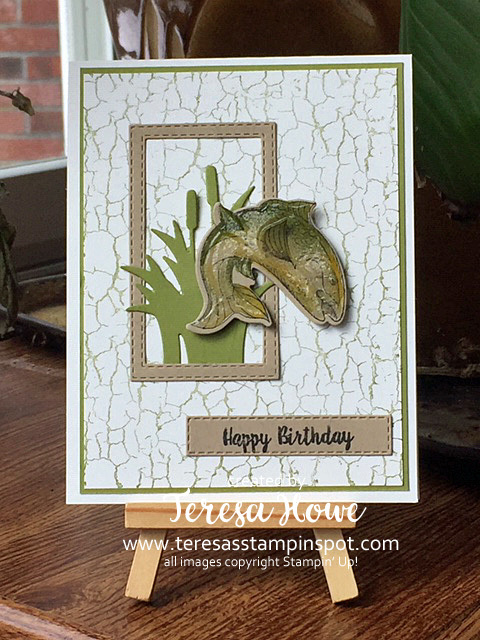 For the background on the card, I stamped the Crackle Paint Stamp set in Old Olive ink on Whisper White. The cattails were die cut from the coordinating framelits from Old Olive Cardstock. The Rectangle frame uses the new Stitched Rectangle Framelits in the Occasions Catalog as well. I just layered two together and ran through the Big Shot once to make the frame. Very easy and I love the stitching on it! The sentiment is from the Piece Of Cake stamp set. What do you think? Do you have fishermen on your friends and family list? This would be a great bundle to use for birthday, Father’s Day or even Thank You! 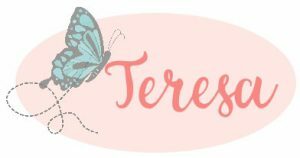 Author TeresaPosted on February 26, 2019 February 26, 2019 Categories CardsTags 2019 Occasions, Birthday, Facebook Live, Masculine1 Comment on The One That Got Away? Hi! Today I am sharing a more masculine Valentine! I am pretty happy with how this turned out and think it suits my guy pretty well. I shared this card this past week during my Tuesday with Teresa Facebook Live. 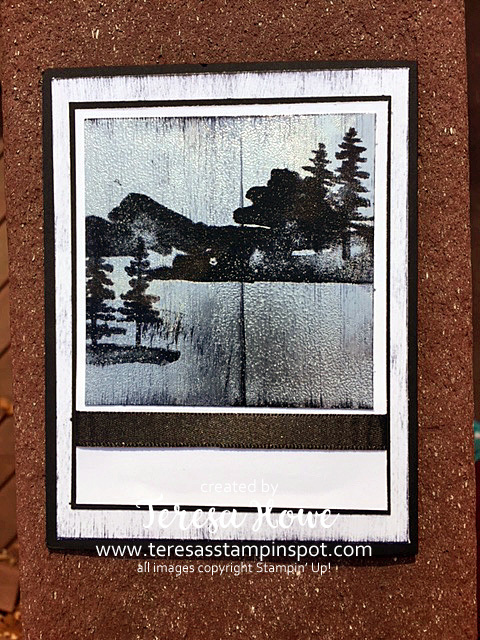 The background is created by using a Sponge Brayer and the Basic Gray ink pad on Glossy White Cardstock. Love the ombre look I achieved. The rest is straight forward die cuts – the heart and LOVE are dies in the Sunshine Wishes framelits while the YOU is from the Celebrate You die set. Just realized – no stamping! Wow! I just wanted to share that while you may not own a set specific to Valentine’s Day – you probably have products that you can use to make a Valentine’s Day card. Hope you enjoyed today’s card! Come back on Saturday – I’ll be sharing a cute treat holder using the Animal Outing suite in the Annual Catalog. Hi! How are you today? Sorry I didn’t get to post the other day – I’ve been trying to get better about posting 3-4 times a week – and that didn’t happen. But, I am back today with a card featuring the Waterfront stamp set. 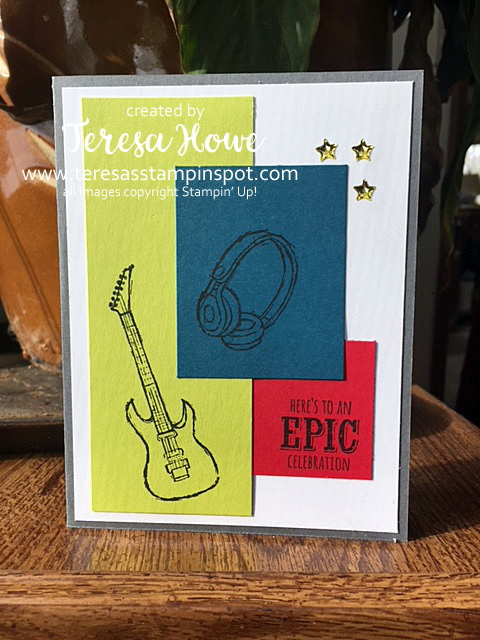 This is the card I featured at the Catalog Kick-off back in June to showcase the Stamparatus tool. This tool makes it so easy to create scenes such as this one – and to mass produce them as well. The mountains are stamped in Soft Suede, the water in Balmy Blue, the trees in Old Olive and the sun in So Saffron. The Sentiment is from the Varied Vases stamp set and is stamped in Soft Suede ink. 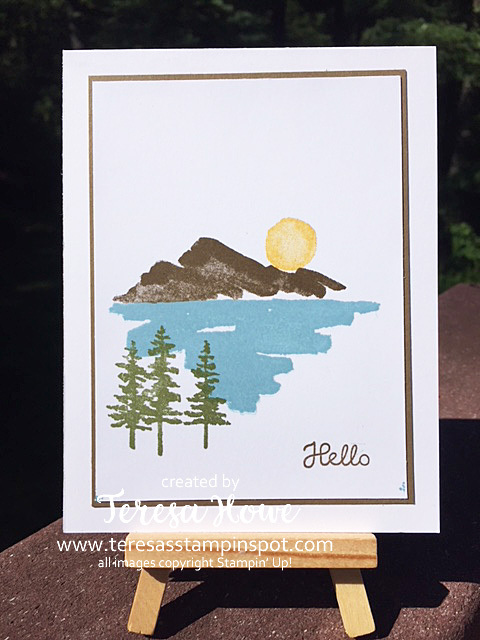 The mountain scene is stamped on a piece of Whisper White Card stock that measures 3 3/4 x 5″. This is mounted on a piece of Soft Suede card stock that measures 3 7/8″ x 5 1/8″. The base of the card is thick Whisper White measuring 4 1/4″ x 11″ – scored at 5 1/2″ and folded on the score line. These products can be found in my on-line store here. This card does have some sentimental value to me as well as growing up my family would spend a week at a lake in the summer and sometimes I’d get to see a view similar to this. This coming week I’ll be showcasing a few cards featuring the new Blended Seasons bundle that is available for purchase for August only. Stay tuned! Hi! Today I have a card featuring one of my all time favorite sets in the Annual Catalog – Vintage Leaves. I am extremely sad to see this set and the coordinating framelits leaving this year. 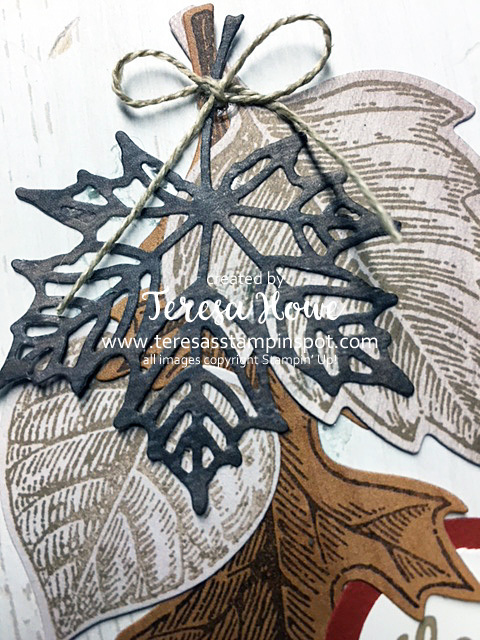 Even the die cut leaf (die cut using the Seasonal Layers thinlet) is die cut from the Wood Textures Designer Series Paper. The other leaves were stamped in Chocolate Chip and Crumb Cake. 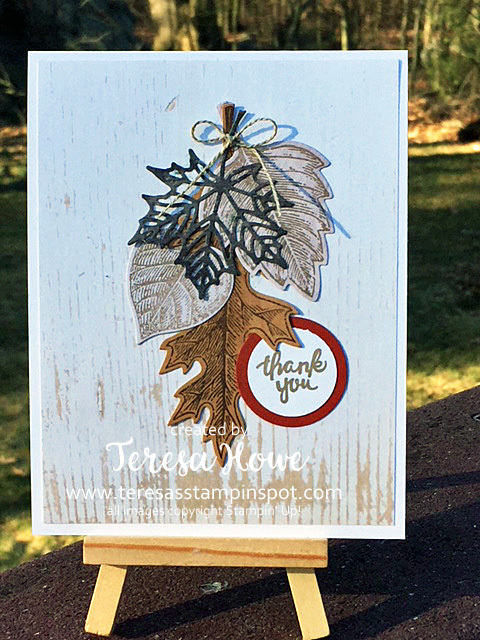 The leaves are layered on a 4″ x 5 1/4″ piece of Wood Textures DSP and the base is a 4 1/4″ x 11″ scored at 5 1/2″ of thick Whisper White card stock. The sentiment is stamped in Chocolate Chip (going to miss this color!) and is from Wood Words stamp set. This is punched with a 1″ circle punch and layered on a 1 1/4″ circle punch of Cajun Craze card stock. A bow made from linen thread finishes off the card. If you haven’t yet purchased the Vintage Leaves stamp set and coordinating Leaflet Framelits, I highly recommend getting them now! Shop my on-line store and use Hostess Code: 4CKMSHRT This is a great masculine, Thanksgiving, Thank You, Fall, Thinking of You stamp set. 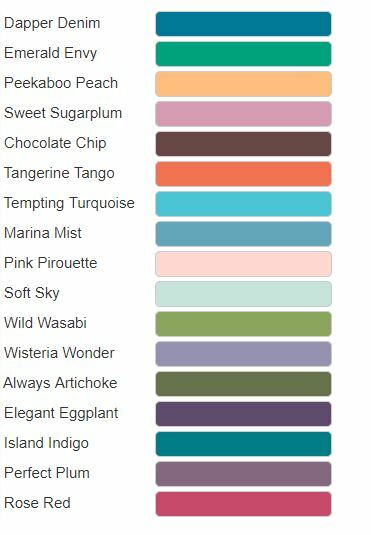 Don’t forget to stock up on the retiring colors – especially grabbing a reinker and cardstock! Hi! How are you? 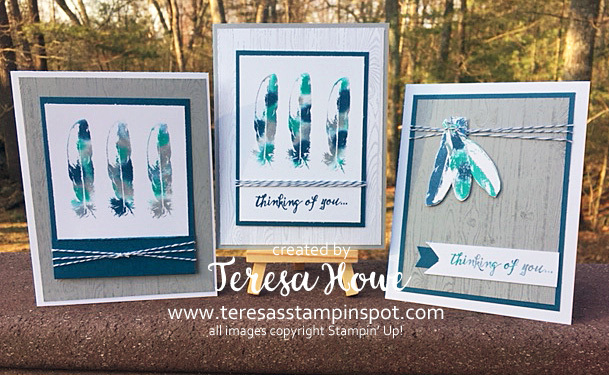 Today I am excited to share with you the trio of cards I made using the Feather Together stamp set from the Annual Catalog. I just LOVE these!! 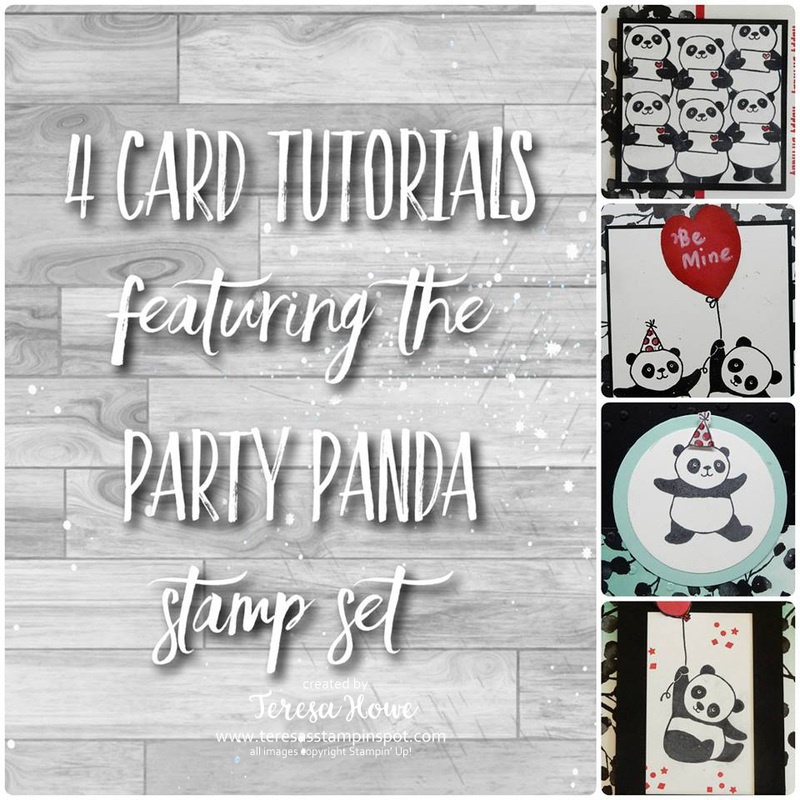 On Tuesday’s with Teresa Facebook Live, I demonstrated how to do the Baby Wipe technique and shared how to make the first and second cards in the picture above. 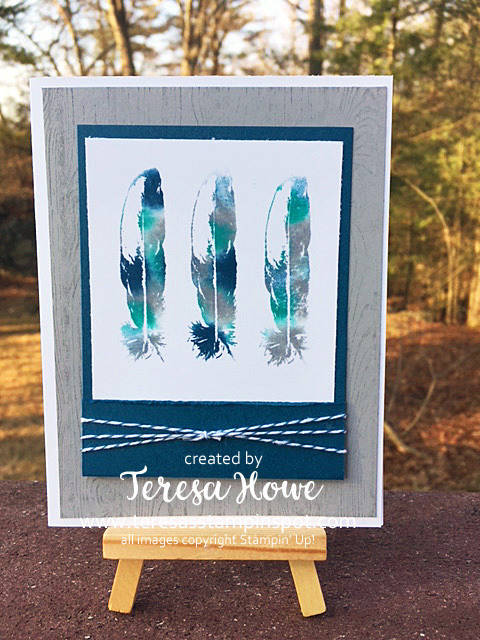 After the Live Demonstration, I had some feathers that I had stamped and was trying to figure out what to do with them when I came up with the third card. All three cards use the same basic supplies and technique – but each have a little different look to them. 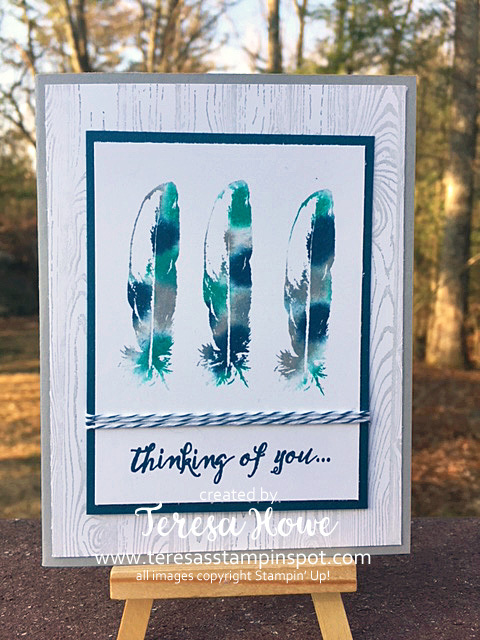 For this card, the stamped feathers are attached to a Dapper Denim layer which is then scored and folded up over the bottom of the Whisper White. I distressed the edge with my thumb nail then wrapped the Dapper Denim baker’s twine around the bottom and tied a knot. The Smoky Slate mat is stamped with the Hardwood Stamp that was inked in Smoky Slate. The base is Thick Whisper White cardstock. For this one, I just mounted the stamped panel on a Dapper Denim mat and wrapped the Baker’s Twine around three times. The Hardwood is inked in Smoky Slate and stamped on Whisper White and my base is Smoky Slate. 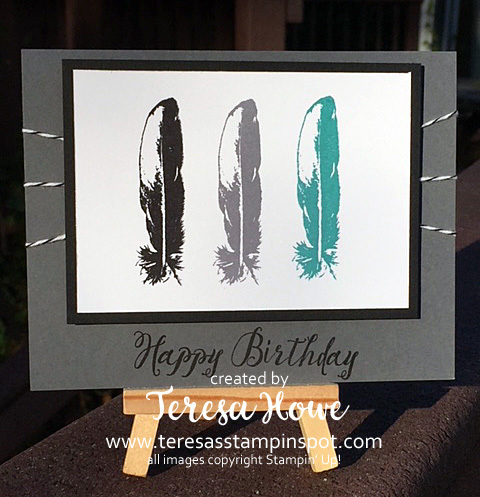 For the final card, I stamped the feathers on scrap Whisper White and fussy cut them out with Paper Snips. The Hardwood is inked in Smoky Slate and stamped on Smoky Slate. This is layered on Dapper Denim and the base is back to the Thick Whisper White. The sentiment is also stamped from the Baby White to give it a variegated look to match the feather. I am sad to see this stamp set on the retiring list! If you love these cards as much as I do, make sure you purchase it before it is gone for good! Shop my on-line store with Hostess Code: WZ627AK3 by April 15th and get a FREE Tutorial featuring the Hold on to Hope Bundle! Hi! 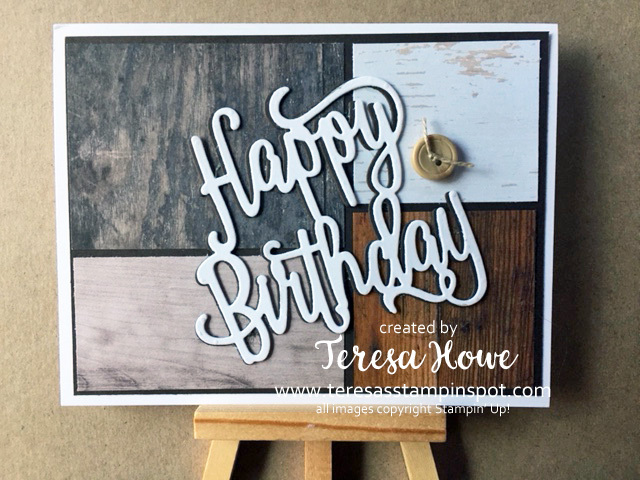 Today I have a card for you featuring the Wood Textures Designer Series Paper stack. I LOVE this pack of paper – and find it works for all kinds of cards. Today I have a masculine card for you. These are mounted on a piece of Early Espresso card stock measuring 5 1/4″ x 4″. I die cut Happy Birthday in both Early Espresso and Whisper White. I love the “shadow” look obtained by adhering the Whisper White just a little over to the right of the Early Espresso die cut. The finishing touch is a button from the True Gentleman suite with a small piece of linen thread tied through the holes. The base of the card is Whisper White thick card stock cut at 5 1/2″ x 8 1/2″and scored at 4 1/4″. 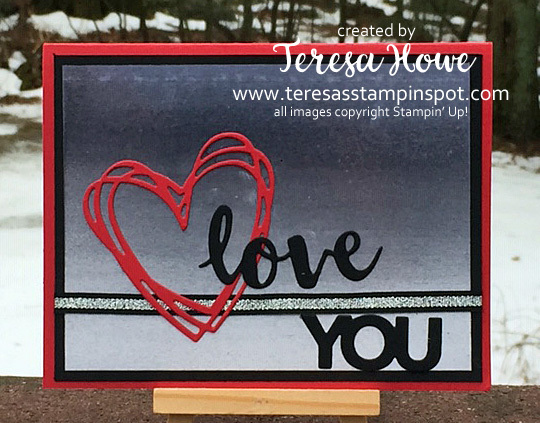 I demonstrated how to make this card on this past Tuesday’s session of Tuesday’s with Teresa on my Facebook page. Look for the video marked – Tuesday’s with Teresa – Wood Texture & Wood Words. I’ll be back with a different look for the Wood Textures Designer Series Paper in a day or so. In the meantime, don’t forget that the 2016-2018 In Colors will be retiring soon! Once the retirement list comes out, these products tend to sell out quickly. Avoid the rush, and place your order today in my On-Line Store! Use Hostess Code: WZ627AK3 for orders less than $150 and get a FREE little something from me! Hi! This morning I have a card featuring the Black Ice Technique that was developed by Melissa Kerman. This is such a cool technique – I just love the results! It is a little hard to capture in pictures, but in real life, it looks like there is are thin lines of ice running down the picture. For my card, I used the Waterfront stamp set in the Occasions Catalog. I LOVE this set!!! If you get nothing else from the Occasions catalog, get this set! It is perfect for so many occasions. Drag Basic Black Archival Ink Pad down the Silver Foil card stock – try and keep it straight to get black lines running down the card stock. Stamp your images in Basic Black Archival ink – the foil is slippery – so be careful when stamping to not have it slide. Use a Piercing Mat under the foil to help with getting a crisp image. Let DRY!! (You can use a heat gun to step up this process – but you want it dry! Drag the Versarmark Ink Pad down over the entire image (similar motion to what you did with the the Basic Black Archival). Do not press down too hard – a light touch is preferred here. Sprinkle Clear Embossing Powder over the entire image. Tap off excess. I left room at the bottom for my sentiment. I added the Basic Black Shimmery Ribbon beneath the Silver foil. Don’t forget, we are in the final month of Sale-A-Bration! Shop my on-line store with Hostess Code: 9PSW36TE to get your FREE products! 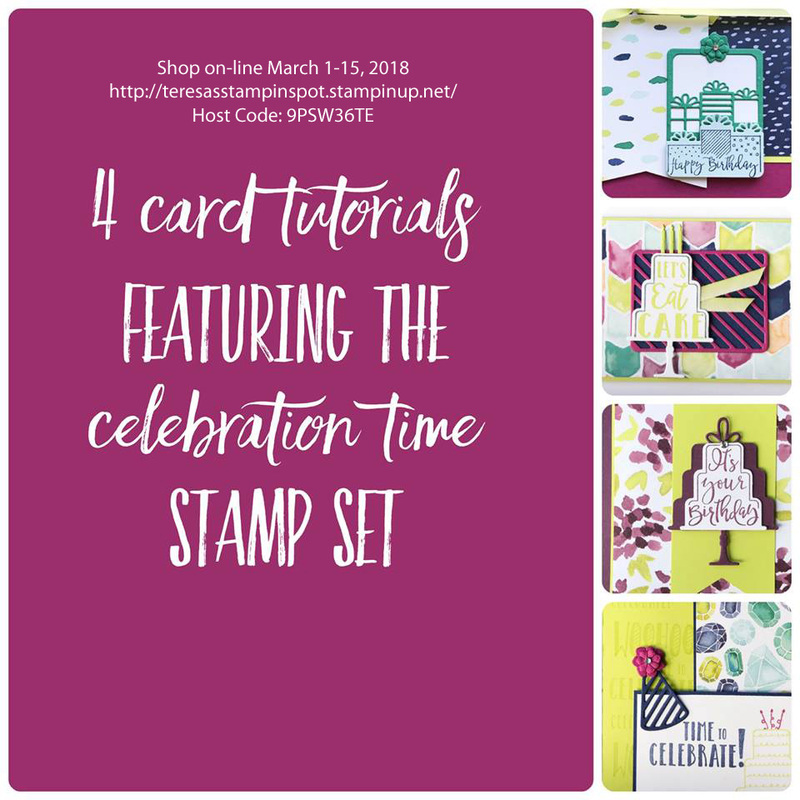 $50 (US, prior to S/H and tax) not only qualify for a FREE Sale-A-Bration product, but also this tutorial featuring the Celebration Time stamp set! Don’t forget, if you host a party (or place an order of $250 US) you get an extra $25 in hostess dollars! Or JOIN MY TEAM and choose 2 extra stamp sets FREE! Contact me today!! Or sign up here! Hi! How are you today? I hope 2018 is starting off on a good note for you! Today I have a card featuring the Epic Celebrations Sale-A-Bration set. You can earn this set FREE with a $50 purchase (US, prior to S/H and tax). It is a great set for the teens and males in your life! I do tend to struggle with masculine – especially teen – cards. I think this set will make it much easier! I’ll keep playing around with it and sharing my creations with you. For this card, I used Dapper Denim, Lemon-Lime Twist and Real Red for my color blocks. The images are all stamped in Basic Black Archival ink. These are layered on Whisper White and I went with Basic Gray for my base. I added 3 Metallic Enamel Stars to finish off the card. Pretty simple and straight forward. Don’t forget to take advantage of Sale-A-Bration! Three great ways to save on the products you love! Shop: For every $50 USA (prior to S/H and tax) you can choose a Level 1 Sale-A-Bration item from the brochure for FREE! There are two Level 2 items which are available with a $100 USA (prior to S/H and tax) purchase. Host: Host an Online, Facebook, Catalog, In-home Party or place a single $250 order and you will earn an additional $25 FREE in product of your choosing! Contact me soon to set your date! Join: Join my Stampin’ Up! Team and choose an additional 2 Stamp Sets in your Starter Kit FREE!! The kit is already a great value at just $99 (plus tax) – where you choose $125 in merchandise plus get business supplies to get you going. Now you can add any 2 stamp sets of your choosing (excluding Sale-A-Bration products) FREE! Ready to sign up? Click here to join! Ready to place your order? Shop here by January 15! Use Hostess Code: WTMEDAAN and earn this tutorial FREE with a $50 purchase! Hi! Since I had out the colors and card stock from the previous card, I decided to make another card for the guys. I just love how this turned out! The feathers are from the Feather Together set (as is the sentiment). They are stamped in Basic Black, Basic Gray and Bermuda Bay. I used the Black bakers twine behind the feather panel. The sentiment is also stamped in Basic Black Archival ink. Not a lot of fuss and pretty quick to stamp and put together if you are looking for a relative quick and easy card. One Tip – Clean the feather stamp thoroughly between colors…. ask me how I know…lol. Today is the last day to take advantage of the Buy 3, Get 1 FREE Designer Series Paper sale! There are some great designs as part of this sale. Just click the link on the right to go to my store and place your order. But hurry – there are only a few hours left!